Usually I don’t pay much attention to our seemingly arbitrary National Food Days. I never really understood all of these special food-designated “days”… who decides which day is when? Why can’t everyday be Milkshake Day? How come there is no National Shakshuka Day? These are the questions that plague me as I toss and turn at night. Then I heard that today is National Grilled Cheese Day. Ohhh boy. They’d honed in on my weak spot. Grilled cheese, macaroni and cheese, potato cheese gratin… basically, cheese is my kryptonite. Melt some cheese on toasty bread (sourdough, please) and I’m officially hooked. Life is too short NOT to celebrate National Grilled Cheese Day. I wanted to create a unique grilled cheese sandwich, something a bit outside the realm of ordinary. My sandwich is inspired by the Mediterranean and Middle East. I started with feta. It’s not a great cheese for melting, but I love feta’s salty, briney flavor. I paired it with a much more melt-able pepper jack cheese, which is ooey and gooey and has a terrific spicy kick. To balance out the salt and spice, I added sweet sliced tomato. The final touch? A sprinkle of za’atar spice blend. If you’ve never heard of za’atar, where have you been hiding? This stuff is magical. I learned about it in Israel several years ago, and it’s become my go-to sprinkling spice. Most Middle Eastern and kosher markets carry it. Sprinkle it on pretty much anything savory for depth of flavor… add it to olive oil for dipping bread, stir it into soups and stews, use it to enhance an omelette, or sprinkle it on this delectable grilled cheese sandwich. Grill these simple ingredients together on sourdough bread (San Luis Sourdough from my hometown, if you can find it) and prepare to swoon. Happy National Grilled Cheese Day! You’re welcome. 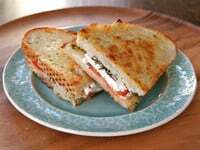 A grilled cheese sandwich inspired by the Middle East and Mediterranean with feta, pepper jack, tomato and za'atar. Stir together the melted butter and olive oil in a small bowl. If the butter in unsalted, add a pinch of salt to the mixture. 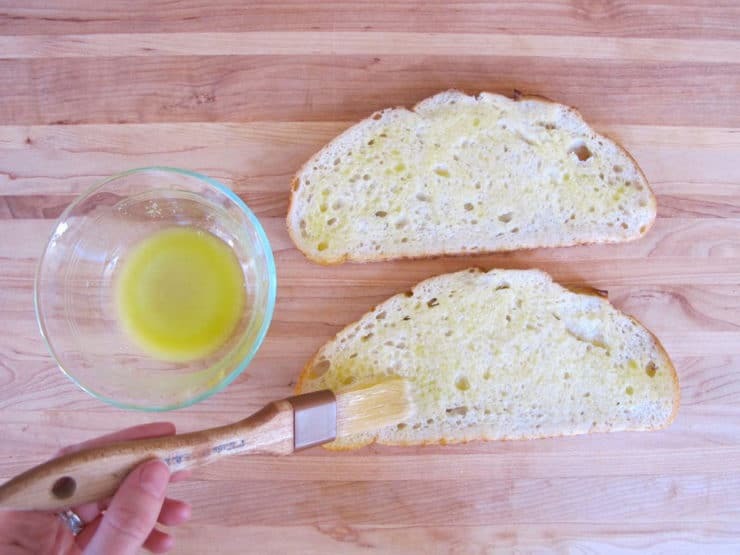 Brush one side of each slice of sourdough with the olive oil butter. Heat a nonstick skillet over medium. 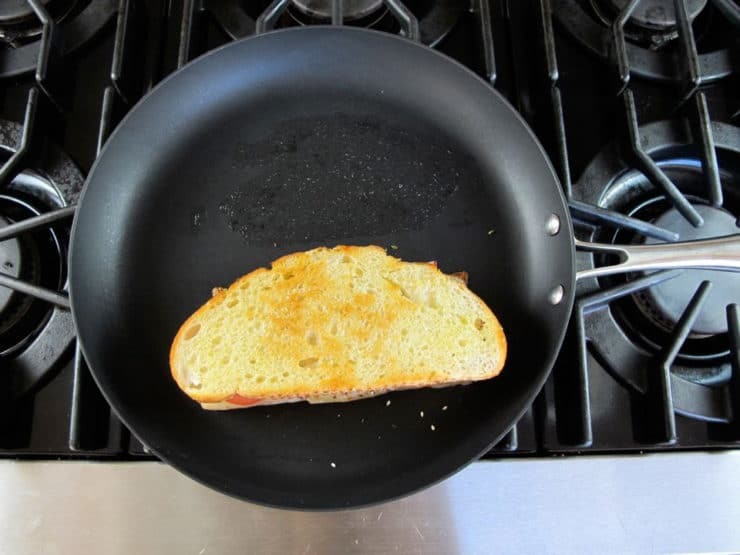 Place the sourdough slices, buttered-side down, into the skillet. 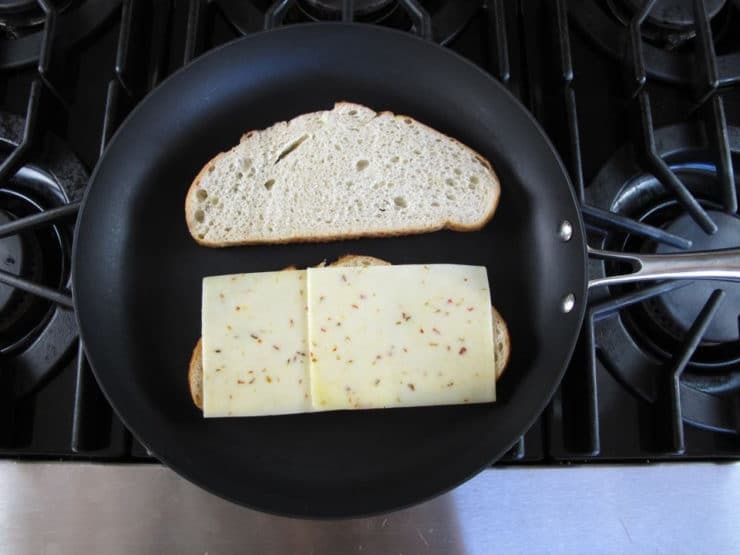 While the bread is warming in the skillet, layer the pepper jack cheese on top of one of the bread slices, so there is very little overlap and most of the cheese is on top of the bread. Place the tomatoes in a single layer across the top of the pepper jack. Place the feta pieces evenly across the top of the tomato slices. 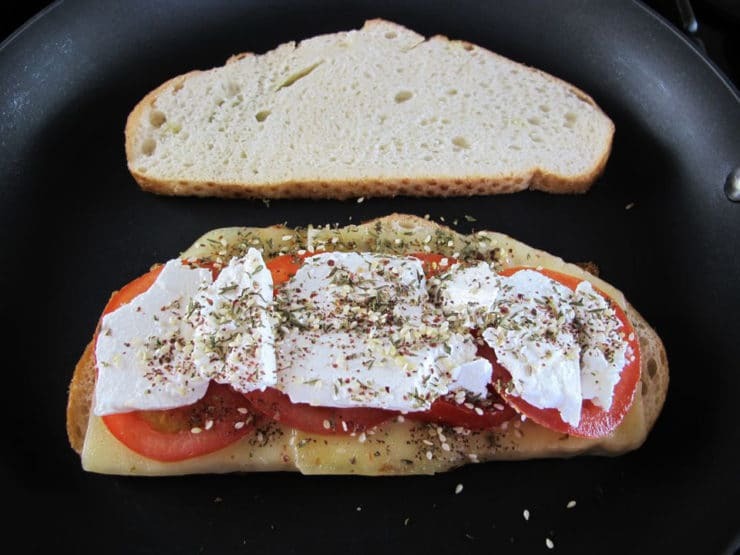 Sprinkle the feta with the za'atar spice blend. 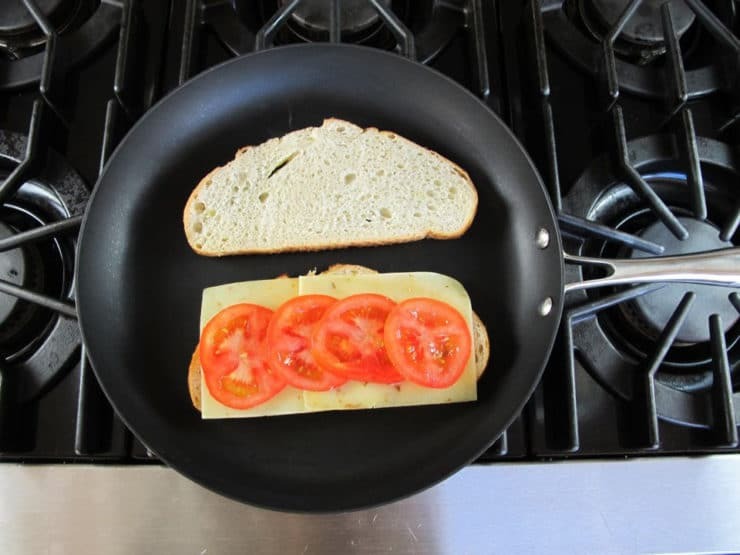 Use a spatula to scoop up the empty slice of bread from the skillet. Place it on top of the sandwich filling, buttered and browned side facing upward. Grill till the bottom of the sandwich is nicely browned and golden. Flip the sandwich carefully. Let it continue to grill till browned to your liking. Serve warm straight from the skillet. 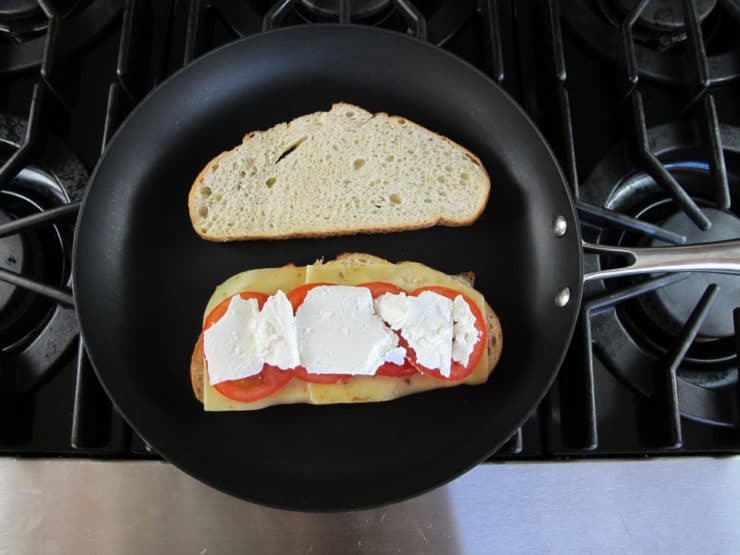 Alternatively, you can grill this sandwich with a panini press. I live in your home town where is the best place to buy the special stuff? Hi James, do you mean you live in Los Angeles or SLO? In LA your best bet is Cambridge Farms or the kosher district on Fairfax. Try to buy an Israeli feta if you can find it, in block form… it’s so creamy! San Luis Sourdough can be found at most Ralphs markets. If you’re in SLO, I’m not really sure where the best place would be for this kind of thing. Let me know if you are from SLO, if you are I will ask my family. Phenomenal blend of savory goodness. Can’t wait to try it. I love Feta and Pepper Jack. Thanks for the idea. Tori this is fabulous, nothing like a great grilled cheese. I get wondering if there’s a Pistachio Day…. I love the comment that melted cheese is your kryptonite…and then sour dough had me drooling. I am somewhat addicted to triple cream brie which does nothing to keeping weight under control but which is wonderful on a low calorie light biscuit. In Australia we have a long wafer called Cruskits. Just made for brie. Now I have a longing for some melted cheese. Glad it is breakfast time. I enjoy your blog and recipes……have always had a nice collection of Jewish cook books and here in Victoria/Melbourne, we have an area in Ackland St, St Kilda that has about 4 Jewish cake shops very close to one another. Fortunately it is about 35 mins away but just looking at the selection in the window causes weight to come zeroing to the body. I think a lot of these people originally came from Europe and brought their wonderful skills with them. We are certainly blessed to have them in our city. It is so my kryptonite!! I think I need a cheese lovers support group. I love feta cheese and prefer it most of the time on, over, in anything. But you are right, not the best cheese if you want it to melt. Grilled sandwiches are my favorite quick dinner. Only cheese made in Greece can be called feta, it’s a protected name. Have you ever tried halloumi? Delicious with pan fried and with a squeeze of lemon or lime. Also good alternative to a burger cooked with a large mushroom. While the name feta is protected in the EU, in the US the name can refer to cheese imported from a variety of countries including Israel and Bulgaria. I love halloumi! I grill it up and toss it into salads frequently. Hey Tori, I’m involved in a Grilled Cheese Throwdown in June. How does an old fashion Corn Rye sound for this? Yummmmm? Excellent! I made this with fresh-baked vegan challah and goat cheese instead of feta, and it turned out great. Fabulous Molly! Challah is a great choice, and I’m sure the goat cheese was delish as well. This looks super fantastic! Love the feta in there! !